I thought it would be fun to check out a restaurant I had wanted to experience for awhile with my, then boyfriend and now husband, which was in Northwest Portland. We met at Olympic Provisions for an early dinner. He was into the local charcuterie and I loved their small plates. I had heard they also carried some great wine to compliment their small dishes. I couldn’t wait!! I ordered a glass of wine and I can’t remember what it was because the next glass I had was spectacular and didn’t matter what I had before!! The funny story is they had ran out of the previous glass of wine I was drinking and offered two other wines. Our waiter was very generous and provided a taste of each wine they were offering. One was a red blend very big, bold, and jammy; the second glass was a cabernet franc from France. I inhaled deeply and absorbed the contents. I knew I would enjoy this one immensely. I offered my date a chance to smell and taste. His eyes got so big as a huge smile filled his face. He smelled the Cabernet Franc and he immediately ordered a glass for each of us! We had to see the label and I took a picture of it so I could try to find it and actually purchase a bottle for his upcoming birthday as a surprise. 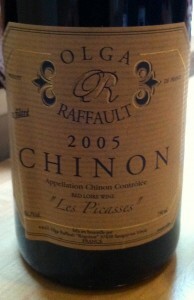 The Cabernet Franc we both thoroughly enjoyed is the Chinon Olga Raffault Les Picasses 2005. I felt as though I had been transported to a cafe in a small town in France with green fields bounding out before me. Light waifs of coffee floating in the warm breeze as I sit at a small table outside on the cobblestone pathway. I was able to find a distributor and purchased 4 bottles!! To this date this is still my husband’s favorite wine and one I truly enjoy. Chinon wine is grown in Touraine within the Loire valley. This area is unusual because mostly Cabernet Franc grapes grow in the area with very little white or rose grapes. The terrain is steep containing rock and limestone creating a very harsh terrior. The lower areas of Chinon create light to medium bodied red wines with flavors of anise and blackcurrant. The upper ridges create more tannic and full bodied red wine with hints of spice. Taste: Robust Mineral, Raspberry, Cherry, Anise, Clove, hint of oak and vanilla on the finish. I saw a 2008 not to long ago and will have to pick it up to discover the differences in vintages. But also to enjoy another great Cabernet Franc from Chinon!